Hobart Township Supervisors would like to caution residents that it is UNLAWFUL TO DUMP, PLOW, OR PUSH SNOW FROM PRIVATE DRIVEWAYS ONTO OR IN THE TOWNSHIP ROAD RIGHT-OF-WAY. Under Minnesota Statutes, Chapter 160.2715, violation of the above statute is a misdemeanor. Snow dumped on roads or the right of way can create a hazard not only for motorists, but for snowplows. 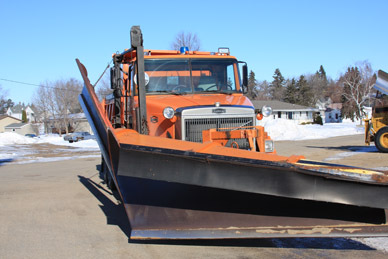 Even heavy snowplows have been ditched and damaged when hitting compacted and frozen snow. Snow pushed onto township, county, state or US highways may cause snowdrifts, which are hazardous to motorists. The person responsible for depositing snow on or in the road, ditch, or right-of-way may also be liable in a civil lawsuit of damages or injuries occurred as a result of this action. Residents that continue to place snow on or in the township road, ditch, or right-of-way will face removing that snow at their own expense. We urge you, as good neighbors and motorists, not to add to the hazards of winter driving. All bills must be submitted to the Town Clerk by the first Monday of each month for payment at the monthly meeting which is held on the second Tuesday of the month. Anyone wishing to bring any business before the Board, must call the clerk by the first Monday of each month to be placed on the agenda for the monthly meeting, which is held on the second Tuesday of the month. More policies and procedures will be posted as they become available.